Ecotrust Hosts Talk by Author of "Kitchen Literacy"
PORTLAND, Ore. — October 23, 2007 — Ecotrust's Food and Farms Program welcomes Oregon writer Ann Vileisis, Author of "Kitchen Literacy: How We Lost Knowledge of Where Food Comes from and Why We Need to Get It Back," for an evening presentation and slide show discussing her new book. The event will take place 5:30 p.m. to 6:30 p.m., Monday, November 5, in the Ecotrust Conference Center. Admission is free and no reservations are needed. "'Kitchen Literacy' chronicles a history of our changing awareness—not only of food but of nature itself—takes us to bustling city markets, school gardens, ad-packed women's magazines, and home economics classes," says Author Ann Vileisis. "While the distance between farm and table grew, we went from knowing specific stories behind food's origins to relying instead on advertisers' claims and government assurances." Vileisis will take viewers on a sensory-rich journey through the history of preparing dinner, with special attention to what urban and suburban cooks have known, and not known, about their foods as the distance between farm and kitchen grew. The talk will conclude with a discussion of modern shoppers' renewed interest in knowing more about how and where their foods are produced. The revealing presentation features fascinating historic images and promises to make people think differently about what they know about what they eat. Ann Vileisis is a freelance writer, editor and scholar. Her first book, "Discovering the Unknown Landscape: a History of America's Wetlands" (Island Press, 1997), received the Herbert Feis Award for the best book written by an independent or public historian from the American Historical Association and the George Perkins Marsh Prize for the best environmental history book of 1997 from the American Society of Environmental History. 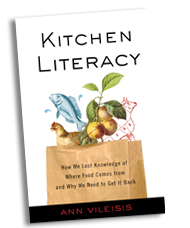 While researching her new book "Kitchen Literacy," Vileisis was a short-term fellow at the Smithsonian Institution's National Museum of American History, and a writer-in-residence at Mesa Refuge at Point Reyes, California. Vileisis lives with her husband in the small town of Port Orford on the Oregon coast. Since 2001, Ecotrust's Food and Farms Program has been investing in building direct market connections between farmers, ranchers and fishermen and restaurant chefs, grocery retail buyers, institutions and distributors. One of five major program areas of the Portland, Oregon-based nonprofit Ecotrust, the Food and Farms Program is building a vision for a sustainable food system. YOU ARE HERE: Ecotrust.org » About us » Press Room » Ecotrust Hosts Talk by Author of "Kitchen Literacy"